I’ve been working full-time for last 10 years at Big Company doing Big Company Function. I recently enrolled in a local part-time MBA program. How do I take advantage of this opportunity to break into a good consulting firm? Before we start, let me put a big disclaimer here. Below, I lay out the 6 steps you need to take to maximize your chances. If you’re interested in self publishing a book, check out Hyperink! A part-time MBA from UCLA is better than a part-time MBA from University of Texas-El Paso. In fact, one guy even got into Bain this way! Brand equity matters as much here as it did for undergraduate and graduate programs. Go to the best school that you can. Better schools provide more recruiting resources (including dedicated job placement counselors), a more plugged-in student base, a stronger alumni network, and access to more consulting firms. The most frequent mistake I see students making is that they don’t start thinking about jobs until they’re several weeks into their first semester. If you’re serious about consulting, recruiting starts when you get accepted. Reach out to the Career Center on-campus and ask them what resources are available to help you achieve this goal. They will have prep resources (eg, The Vault Guides, subscriptions to online career databases), access to Alumni networks, and potentially even contacts at your target firms. This is huge! Some programs will have recruiters whose sole aim is to help you find jobs. Establish contact before you set foot on campus. Often they split time between the part-time, executive, and full-time MBA programs so it’s critical to build a solid relationship, and build it early. This is covered in #5, but have an updated resume and cover letter ready. Ask to be put in touch with current students who’ve successfully made the transition. Build relationships with those students. Come recruiting time, they may be willing to forward your resume directly to the right recruiters. If the Career Center is not helpful or non-existent, contact the Admissions Office and ask for their help. Now is not the time to be nice – it’s time to get serious about your career. I’ve already covered everything from info session networking to cold calling. Systematically reach out and manage contacts. Use a tool like Highrise to keep track of who you’ve emailed, who you’ve called, and who you need to follow up with. You need to think scale. Assume 2/3 ignore you, and 2/3 of the ones who you talk to can’t help you. That means if you email 10 people, only 1 actually helps. If you email 100 people, now you have 10 people who can help. As a wise man once said, “quantity has a quality all its own”. Actually, it may have been Gideon Yu from Facebook…I don’t remember. Often people get stuck filling roles that are expected of them, for no good reason. Being a part-time MBA doesn’t mean socializing exclusively with other part-time MBAs. It doesn’t mean leveraging only resources explicitly offered via your program. If you’re a part-time MBA at a place like UChicago or Northwestern, consider yourself a full part of that school and all its resources!! There are more than 10 due to ties. See detailed info here. Crash recruiting events for full-time MBAs. Even if the firms aren’t looking to hire part-time MBAs, you can build valuable contacts and ensure your resume gets noticed. Attend undergraduate recruiting events. Same deal here. Join student consulting and business clubs. Another source of events, networking opportunities, and access to recruiters. Your mentality should be “ask for forgiveness, not permission“. Make sure your resume and cover letter are updated. Bring copies of them with you everywhere, but don’t force them onto people – all recruiters hate that. 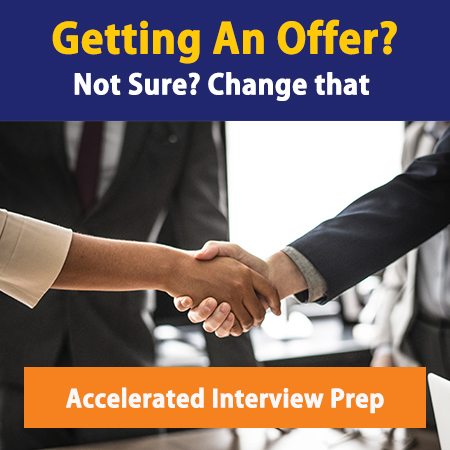 FInally, act like you have interviews and start preparing now. I’ve written several articles about preparing for both the fit interview and case studies. Often, you can give a company your resume Monday, and by Wednesday they’ve emailed you to schedule an interview for the following Monday. Things move fast – be prepared. Well, that’s it. Following these 6 steps will give you a MUCH better chance of actually making that desired transition – and ensure that the $$$s you spend don’t go to waste. What other ways can you take advantage of a part-time/fully-employed MBA program to get into consulting? Was I wrong to assume that it’s nearly impossible to leverage that into an MBB? Comment away. Feedback is always appreciated.